The Swedish pension system consists of three tiers; the national retirement pension, the compulsory occupational pension and voluntarypension. Sweden's public pension pillar is unique in Western Europe. Part of the social security contribution is paid into individual investment accounts and a funded pension is built up with independent fund management companies responsible for the asset management. In addition, mandatory occupational pension schemes are in place for employees working in industries covered by nationwide collective bargaining agreements. Employers who are not part of collective agreements may offer plans on a voluntary basis. Voluntary individual pension savings complement the pension landscape in Sweden. The major component of the state pension system is the income-based pension. It is financed on a pay-as-you-go basis. The contribution rate amounts to 16%, which is recorded in notional accounts. The retirement age is flexible and retirement benefits can be claimed from the age of 61 at the earliest. The pension system is autonomous from the national budget and income-based pension contributions are transferred to the system's buffer funds: the First, Second, Third and Fourth AP (National Pension) Funds. Each fund receives a quarter of the contributions and is responsible for a quarter of pension payments. Automatic balancing means the pension system regulates its own finances and avoids the government having to intervene by raising contributions or borrow money to fund pensions. The premium pension is the funded part of the earnings-related old-age pension. The premium pension system is administered by the state Premium Pension Authority (PPM). Of the pensionable income 2.5% is paid to the funded pension scheme, which is compulsory. The money is deposited in individual investment accounts with individual choice. Employees can choose to have their premiums invested in up to five funds out of more than 700 mutual funds offered by independent fund managers. In addition, the government has set up a special investment fund for individuals who do not want to make their own investment decisions; their contributions are automatically invested with the Premium Savings Fund, which is managed by the Seventh National Swedish Pension Fund (AP7). The individual is free to change the chosen fund at any time and free of charge. The premium pension can be drawn at the age of 61 at the earliest, but it is also possible to postpone withdrawals from the pension account, which requires that the assets are invested in security funds. The Premium Pension Authority is responsible for the operation of the premium pension system. It collects contributions and invests them in the individually chosen investment option; thus, there is no relationship between the individual and the fund manager. Once the pension-saver applies to receive a premium pension he or she is obliged to opt whether to withdraw fund insurance or to convert the account into a traditional insurance plan. Traditional insurance guarantees life-long retirement payments at a fixed rate. In addition to the income-based and premium pension, the guaranteed pension, a means-tested benefit, provides a minimum pension for persons older than 65 with low or no income and at least 40 years of residency in Sweden. It is financed by the government's budget. Second pillar pension benefits are determined by nationwide collective bargaining agreements. Permanent employees automatically belong to an occupational pension scheme. These schemes are known as ITP for white-collar employees and SAF-LO for blue-collar employees. Some industries (e.g. banking, insurance) have other pension schemes than ITP, but the benefit provisions are more or less the same. Employers who are not part of the collective agreements may offer plans on a voluntary basis. These also often follow the range and level of benefits provided under ITP. 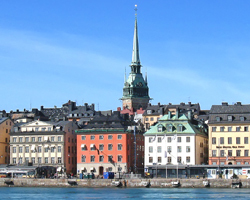 As a result, pension plans in Sweden are extremely standardised. There are 4.5 million active employees in Sweden. The ITP plan covers about 16% of them. Effective July 2007 the ITP switched from a defined benefit (DB) plan to a defined contribution (DC) plan. After 12 years of negotiations between employer and employee unions an agreement was achieved to switch to a DC plan. The old ITP plan will be closed to new participants. The pension plan for civil servants is a DB plan, which covers 700,000 employees. The pension plan for employees of Swedish municipalities is mainly a DC plan and covers about one million employees. There are three methods available to companies to fund pension benefits: pension funds, pension insurances and book reserves. However, their use is influenced by the type of plan concerned (whether it is ITP or SAF-LO), and in some cases, even specific providers have to be used. Book reserves and pension funds are most frequently used for a DB system, whereas for DC liability pension insurance is the usual choice. Risk benefits are typically fully insured, even if the company uses a pension fund or book reserves for financing its pension plan. Pension insurance is the most common form for financing pensions in smaller companies and it is also the dominating form for financing occupational pension for blue-collar workers. Larger companies typically participate in the ITP plan and use book reserves in combination with credit insurance for securing the pension liability. Still, pension foundations are proving to be increasingly popular vehicles, especially among larger companies.